2 many good books, 2 little time! Anyways, yes I found yet another challenge. But have no fear. I get almost ALL of my books from the library. I read waaaay too many books to purchase them. Of course there are some that I can't resist, but overall they come from the library. It seems that I don't even mind paying the late fees because I know it supports them, which in turn supports me and my habit! Support your local library!!!! If you would like to join in on the fun head on over to J. Kaye's Book Blog. --The Mini – Check out and read 25 library books. --Just My Size – Check out and read 50 library books. 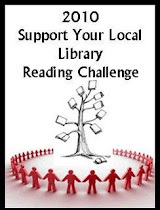 --Stepping It Up – Check out and read 75 library books. -This is my goal! --Super Size Me – Check out and read 100 library books. I will update this post with my books! Yippee! So glad you are joining this one too. Like I said, it's gonna be an awesome year. Heather has read 0 books toward her goal of 100 books. 5 Stars - Dangerous! This book may cause lack of sleep, beware. 4 Stars - Good read. Hard to put down. Definitely grab this one! 3 Stars - Entertaining. Recommended if you do not have your "must read" handy. 2 Stars - I may have finished it, but more than likely I couldn't finish it & Lost interest completely. If a book does not keep me interested and I do not pick it up with in 1 year, it's a dud. 1 Star - Reserved for the most ridiculous insult to one's intelligence. To Be Read, Ahh...if only there were enough hours in the day! Share book reviews and ratings with 5peasinapod, and even join a book club on Goodreads. All of my reviews are from the heart. Even though I may review books that I have won or been given by a publisher or author, my review has not been swayed either way. This blog is affiliated with AdSense and Amazon. Clicking on ads and book hyperlinks may direct you to Amazon, where you can purchase the item. I receive (very small) monetary compensation. Ads helps support this blog. Thank you!